A Crewe School of Motoring certificate from 1963. Homepage. This page: A certificate from 1963 confirming that a Mr Cooper passed his driving test. Crewe School of Motoring test pass. 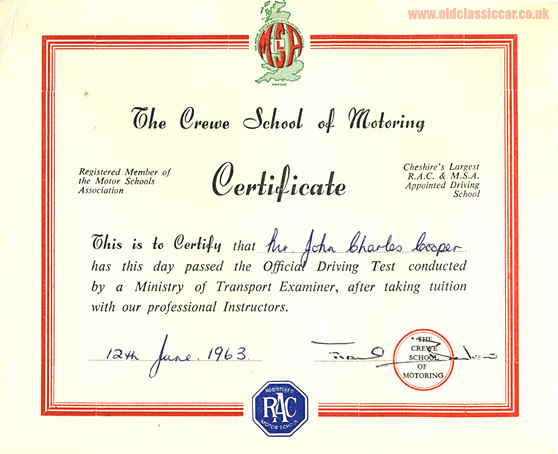 The Crewe School of Motoring was a member of the MSA (The Motor Schools Association of Great Britain), and a registered RAC Motor School, as can be seen on this test pass certificate from 1963. The driver, a Mr John Cooper, passed his driving test on 12th June 1963, having been examined by a Ministry of Transport Examiner. According to this document, the Crewe School of Motoring was Cheshire's largest MSA & RAC appointed driving school. Does anyone remember taking their test after learning to drive with this school, or remember the cars they used in the early 1960s? Cars such as the Austin A40 Farina, and the Triumph Herald with its excellent turning circle, were often used for driving instruction at that time. If anyone has memories of this driving school, or maybe the RAC-approved Safety First School of Motoring in Bradford that also features in this section, please drop me a line. More interesting old items of motoring paperwork can be found in the Motoring Collectables section.